Calling all breakfast sandwich lovers! These Sausage, Egg and Pesto Breakfast Sandwiches are for you! They are delicious, filling and clean. Yup, that’s right. Clean eating breakfast sandwiches that are made with lean ground pork, egg whites, kale pesto and homemade butter-free whole wheat biscuits. Pair it with a side salad, and you have yourself a healthy menu item for your Mother’s Day brunch! If you know me, you know I love my egg muffin sandwiches. I’ve been known to eat them for breakfast, lunch and supper. It’s just the perfect clean eating meal. For breakfast, it goes well with a smoothie or some fruit and yogurt. And for lunch or supper, you can pair it with raw veggies, soup or salad. So versatile! 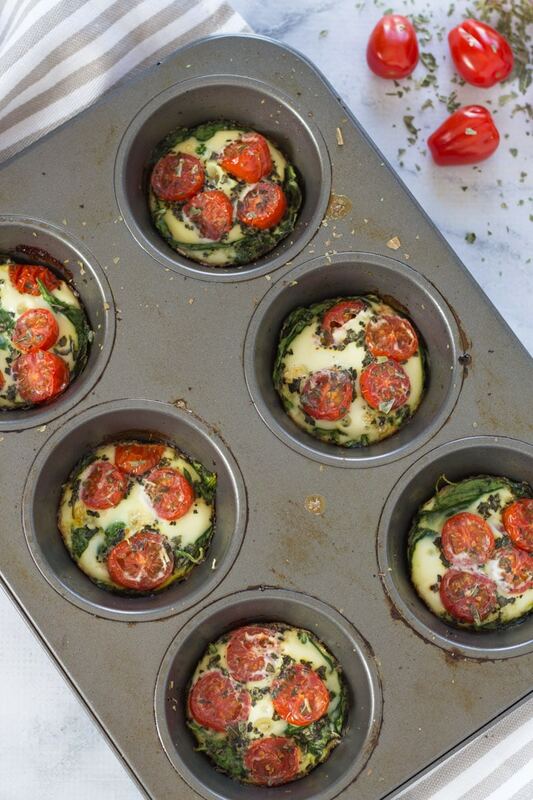 I usually make a big batch of the egg white muffin cups (stuffed with veggies) and freeze them for quick and easy clean eating meals. To add some healthy fats and additional flavour, I mash up some avocado or whip up some of this creamy kale pesto and serve the egg on a whole wheat English muffin. So delicious! 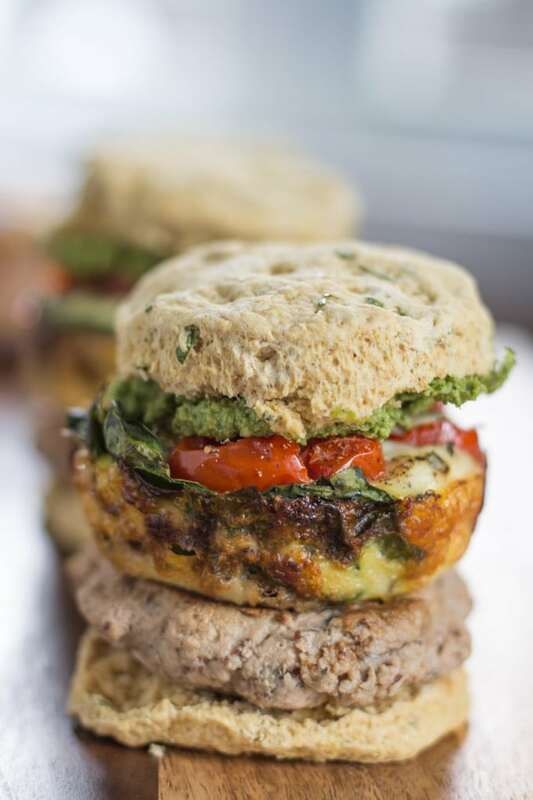 The recipe I’m sharing today for Sausage, Egg and Pesto Breakfast Sandwiches is a variation of my go-to egg muffin sandwich. The big difference? This recipe includes sausage and homemade biscuits. The sausage is not really sausage, but you can’t really tell. And the biscuits?! Well, they are just down right awesome! They have lots of garlic and chives, and have a nice crumbly texture. Yum! I made countless versions of these whole wheat biscuits trying to perfect the recipe. To change things up, I used whole wheat pastry flour. I read that it is lower in gluten than regular whole wheat flour so I wanted to experiment with it. And I wasn’t disappointed. (Well, the first few biscuit attempts were disappointing, but I persevered!) The flour definitely has a different texture than regular whole wheat flour. But it created a biscuit that had a soft and crumbly texture, which was perfect for these Sausage, Egg and Pesto Breakfast Sandwiches! As mentioned, these biscuits are butter-free. In fact, they are dairy-free. Instead of butter milk, I used almond milk with lemon juice. And instead of butter, I used solid coconut oil. The coconut oil was tricky. The key is to put it in the freezer to harden it and then grate it into the flour mixture. This allows the oil to evenly disperse without any chunks getting stuck in the biscuits. If the coconut oil is at room temperature or large chunks are left in the biscuits to melt while baking, this will cause the biscuits to flatten. When I first started making these, there were some flat biscuits being eaten in our house! For the egg muffins, I just divided a small carton of egg whites amongst a large 6-muffin pan. If this is too eggy for you, just use 3-4 tbsp. of egg whites per muffin (just adjust the cooking time appropriately). I also added some spinach, tomatoes, basil and oregano, but you can add other veggies such as peppers, onions and/or mushrooms. This is a great way to incorporate veggies, instead of just cooking the egg whites on their own. While the egg muffins are baking, you can cook the pork sausage patties. These are made from lean ground pork and seasoned with garlic, sage and thyme. This pairs nicely with the apple sauce and maple syrup, which makes the patties taste like real sausages. The maple syrup also gives the patties a caramelized look and taste. I mixed the lean ground pork with the other ingredients the night before and let the flavours blend overnight. If you don’t have time to do this, don’t worry about it. Just assemble the ingredients, shape the pork patties and fry them up. They will still be delicious! Once the egg and sausage are fully cooked, cut the biscuits and assemble the sandwiches. I usually place the sausage on the bottom and top with the egg and then the pesto. 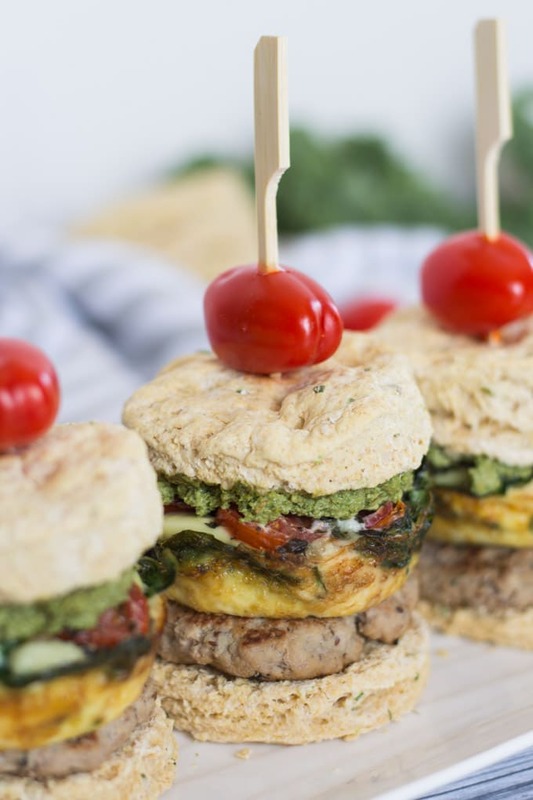 These Sausage, Egg and Pesto Breakfast Sandwiches are big and messy so be prepared to use a fork and knife to conquer them! Or just get right in there and make a mess like I do! Utensils can just slow you down 😉 . Just be sure to have lots of napkins on hand! If you make these for a Mother’s Day brunch, or for any meal, let me know what you think in the comments below! 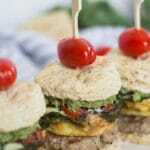 These Sausage, Egg and Pesto Breakfast Sandwiches are meant for breakfast sandwich lovers! Big and messy, but super healthy and clean with lean pork, egg whites, whole wheat butter-free biscuits and kale pesto. This recipe is packed with protein and veggies! And it’s dairy-free! Find the recipe for Creamy Kale Pesto here. Preheat the oven to 425 degrees and grease a medium-sized baking sheet. In a medium sized bowl, combine the flour, chives, nutritional yeast, baking powder, salt and garlic powder. Meanwhile, place the coconut oil in the freezer to harden for 5 minutes and combine the almond milk and lemon juice and let sit at room temperature for 5 minutes. Once the coconut oil has hardened, grate it into the flour mixture. Stir to combine. Next, add the almond milk/lemon juice mixture and stir until the wet and dry ingredients are well combined. Place the dough on a floured surface and knead well (about 10 to 15 folds). Roll the dough to approximately 1″ thick and use a round biscuit cutter (about 3″ in diameter) to cut the dough into 6 biscuits. Bake in the oven for 12 minutes. Remove and cool on a wire rack. Pre-heat the oven to 400 degrees and grease a large 6-muffin pan. Divide the carton of egg whites into 6 muffins. 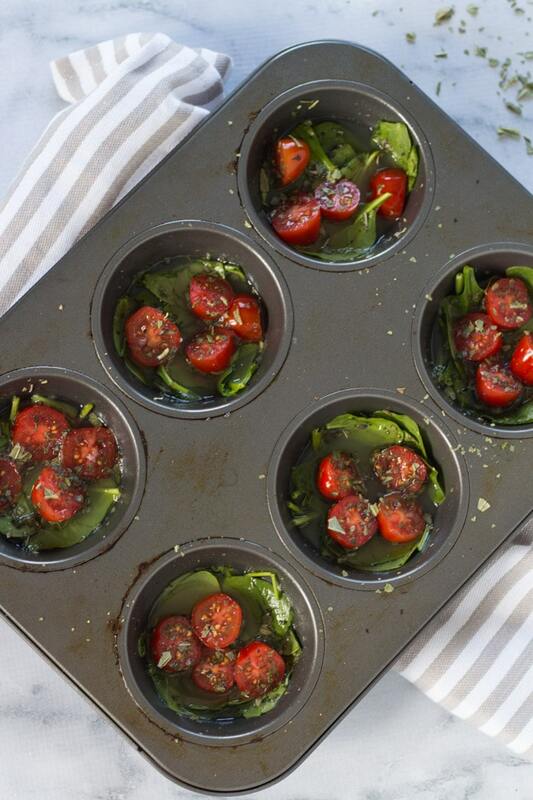 Divide the spinach, tomatoes, oregano and basil evenly amongst the 6 muffins. Add a dash of salt and pepper to taste. Bake in the oven for 25-30 minutes, or until the eggs have puffed up and are fully cooked. In a medium sized bowl, combine all the ingredients (except the olive oil for frying) and stir until well combined. Cover and refrigerate for 6 hours or overnight. Add the patties to the frying pan, which has been greased with olive oil, and cook on low for 12 minutes. Flip the patties and cook for another 10 minutes or so until they are fully cooked. Keep an eye on them so they don’t burn. Y0u may need to flip them over a few times for more even cooking and caramelizing. Cut the biscuits in half and spread pesto on one side. On the other side, add the sausage patty and then the egg. Lay the pesto side on top of the egg. Serve immediately, or store leftovers separately in the fridge. Warm in the microwave when ready to assemble and eat. These should be consumed within 2-3 days. Or freeze the ingredients separately (minus the pesto) to enjoy later! The sausage patties were adapted from this recipe for Sausage, Egg and Cheddar Breakfast Sandwiches from Clean Eating Magazine. For the biscuits, I used refined coconut oil so they wouldn’t have a coconut taste. 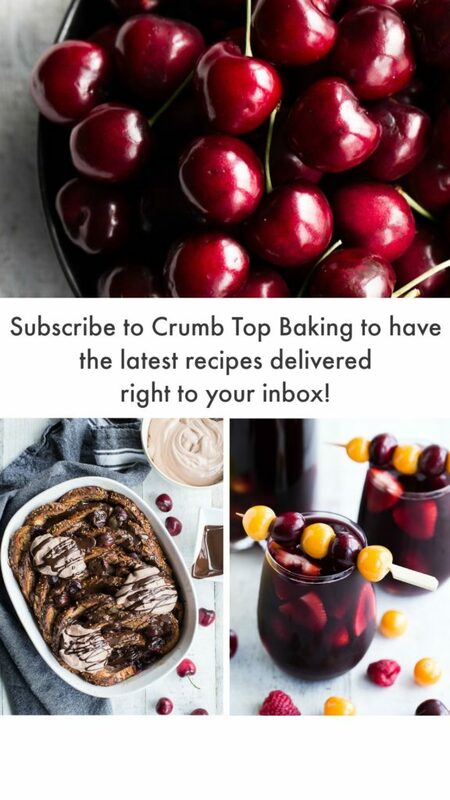 (I like a coconut taste for sweet baked goods, but not savoury). I often make a batch of egg muffins and freeze them for later use. If you do this, just note that when you defrost and heat the egg muffin in the microwave it will be watery. I usually use a paper towel to pat the egg muffin and absorb the water. If you would like smaller egg muffins, you can reduce the amount of egg whites used. Just be sure to reduce the baking time accordingly. Or you could use a smaller 12-muffin pan and divide the carton of egg whites amongst the 12 muffin cups. Again, you will need to reduce the baking time slightly. If you don’t have time to refrigerate the ground pork for 6 hours or overnight, don’t worry about it. This is just done to give the flavours lots of time to blend. 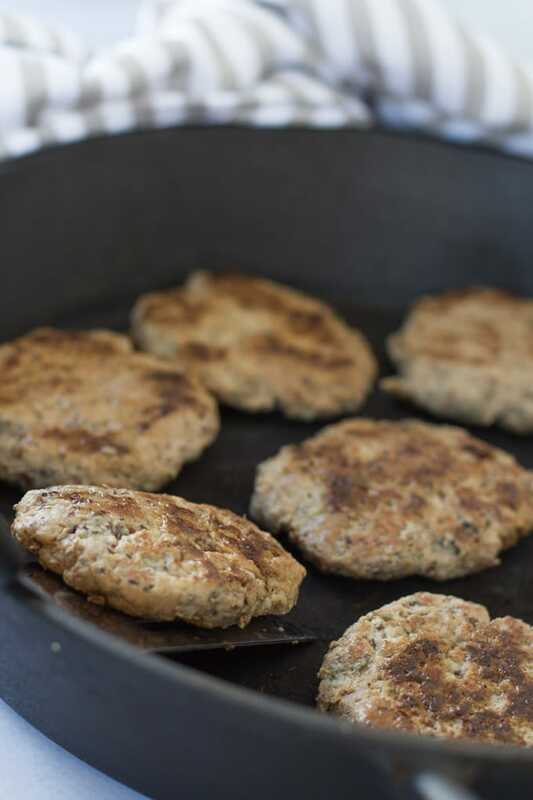 The patties will still have lots of flavour if you cook them right away! If you want the sausage patties a little bigger, make them the size of hamburger patties. This should yield 6 patties. This will be the perfect amount to go with the 6 biscuits and 6 egg muffins! I made the patties smaller because I didn’t want to overpower the egg, pesto and biscuit with the sausage. But there is nothing wrong with having a burger sized breakfast sandwich! Go for it!